Let's Add Sprinkles for the Cozy at Christmas tour. I'm honored to join these friends as we share our homes for Christmas and Hannukah. In this post I want to be very honest about some things. Many of you know my father-in-law passed away the Saturday after Thanksgiving. It was expected but unexpected. He had Alzheimer's for about 13 years so we knew his time was limited but the day he passed it was definitely not expected. We are very sad here at our home. We are trying to smile and carry on but it's hard right now. You know I try my best to be a positive person and that won't change but sometimes holidays have a different feeling and this is the year for us. We waiver between happy because we have so many blessings and sad that we've lost someone so important to us. A family member just reminded me that this will be a hard Christmas for everyone except Papa Bob. We know he is happy in Heaven now and he no longer has Alzheimer's Disease. Anyway, I don't mean to be a downer but I know there are so many others experiencing similar things this year and maybe it helps to know you are not alone. Our main Christmas tree is in the front window of the house this year. 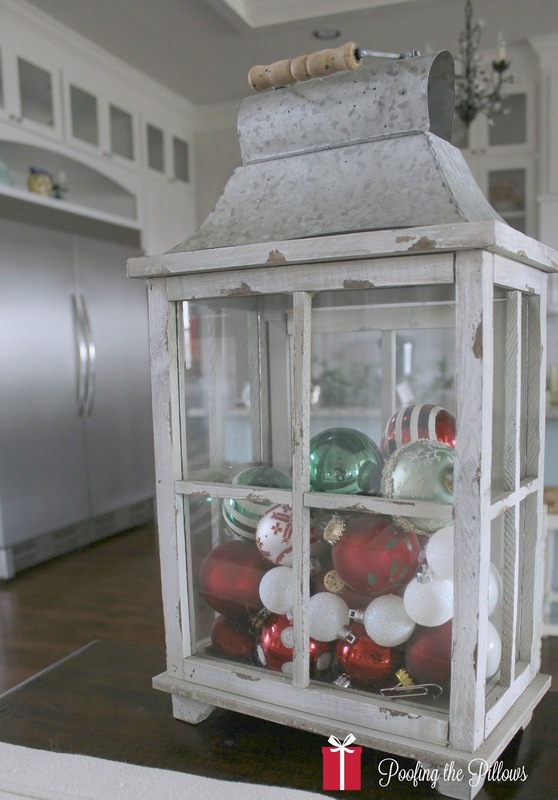 It is filled with old favorites and a few new ornaments with special meaning to us. 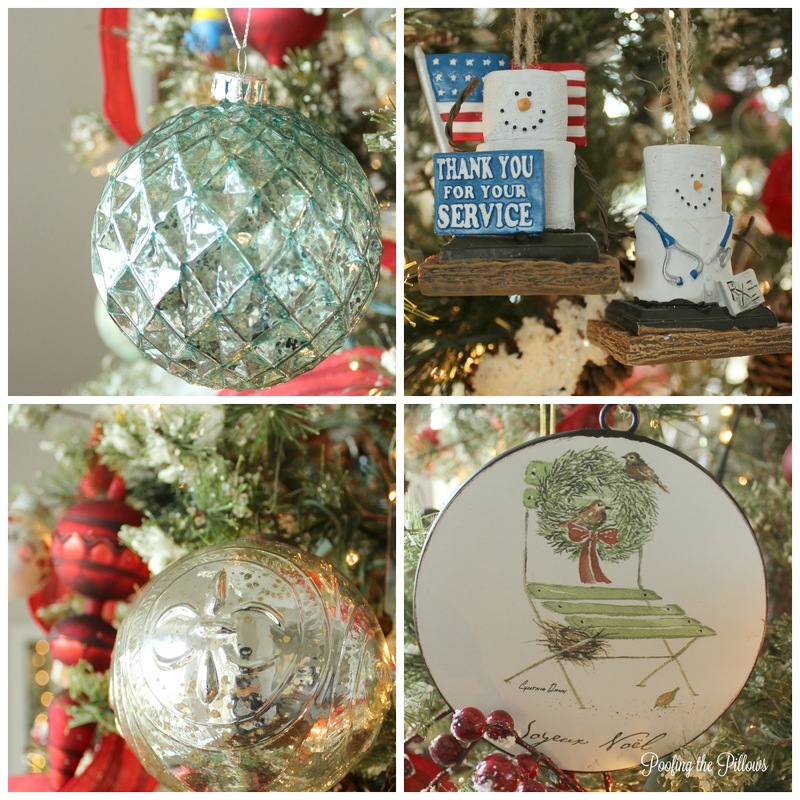 See the soldier and the medical smores ornaments on the tree? Those represent our two amazing sons. Our older son joined the United States Army this fall. Today he is flying from Fort Benning in Georgia to Fort Bliss in El Paso as part of the Infantry. We are so proud of him!! The medical ornament represents our younger son who is about to complete his Bachelor of Science in Nursing in a few months. He is also starting a new job at Parkland Hospital here in Dallas - to him this is the golden egg job. They are both pursuing their passions and that's what we want for our sons. 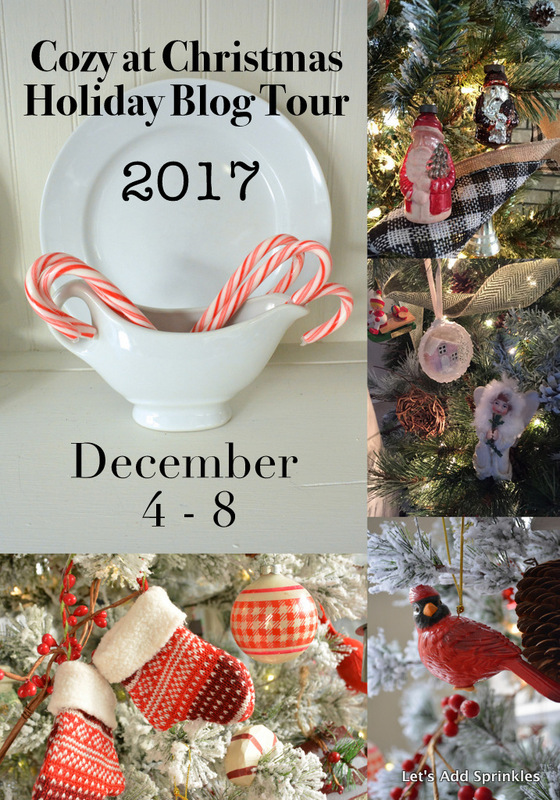 I'd love for you to visit our Christmas kitchen HERE. Things might not be perfect here this Christmas and that's ok. With the amazing parts of life come a few hard parts too. This Christmas my wish for you is to count it all joy! We will definitely be doing that. 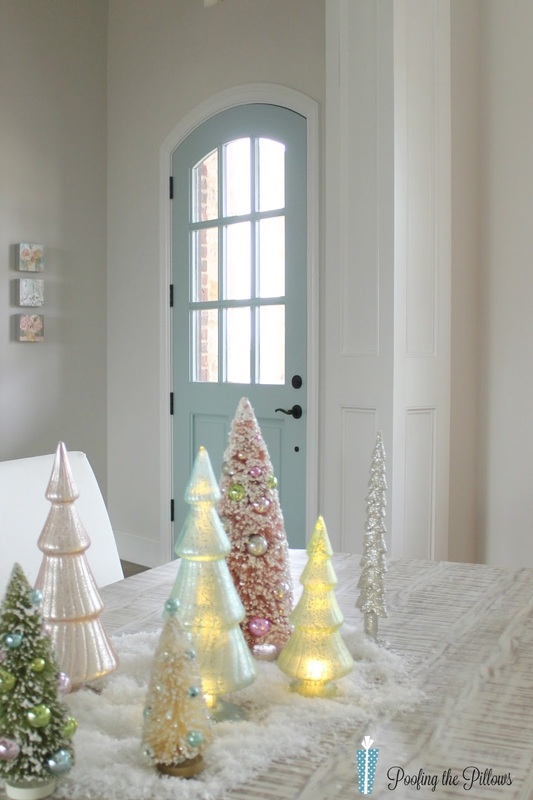 The Christmas Tour of Homes includes 28 bloggers that you'll love visiting! I'm the first comment! How did I do that? Thanks for sharing, Stacey. I've been thinking about you all. I'm so sorry for your loss. Your precious home is gorgeous and I love your wonderful reminder to count it all joy. Thanks for sharing at our tour. I love knowing that your heart is so proud and joyful over the accomplishments of your son's careers. I am so proud of them too, and as we drove together to our wonderful luncheon in McKinney this past week just hearing the melodic tone of your voice I knew life was good. I am sorry for the loss of your FIL, I sure know he blessed your life and you all blessed his. Perfect touches to your forever home, my dear. Your home looks lovely - so peaceful and beautiful. Thanks for sharing your lovely home and your thoughts with us today. You make me want to hug my 95-year-old father-in-law today! And congratulations to your sons, I'm so happy we have young ones in the world who are striving to make a better place for all of us. I feel like I've received a wonderful gift today -- the gift of appreciation for life. 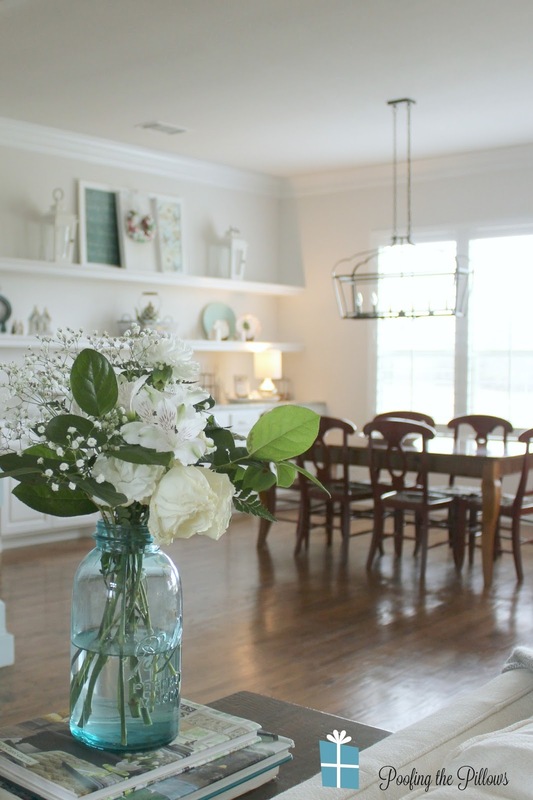 Stacey, thank you for not only sharing your beautiful home, but also your life! I know this is a hard Christmas for your family and I have had you in my thoughts. Congrats to your sons on their accomplishments, it makes a mother proud! Your lovely home is always a joy to visit! Wishing you the peace of Christmas! Stacey your home is beautiful! I totally understand your feeling about this Christmas. I lost my father this past March. I, like you, choose to look for the Joy because I know that Dad is happy and in Heaven. Plus, I know he and my Mom are still with us, just in a different way. Thank your son for his service. What a special young men you have! Again, your home is so pretty. Thanks for sharing. Stacey, your home is your joy, it's evident, and the people who've been a part of each of our lives' will never go away. I know what you mean when you say you expected, though it was still unexpected insofar as timing. RIP to your father-in-law. Your sons' choices are both so admirable. A big thanks to both of them for choosing service. Happy Holidays. Stacey, You have the sweetest way of sharing your heart. I am so sorry to hear about your father-in-law. Unexpected and during a holiday is very hard and you have had a tough schedule. You have handled all with such grace. My MIL has Alzheimer's disease so I can relate to your sadness. She is 91so I am bracing myself for what is to come. Both tours have been delightful. I love your pastel trees sitting on snow down your table. Your tree is stunning in front of your window. I like the angles in your pictures. Great photography styling. I know you are proud of your sons. I will be keeping you in my thoughts this holiday season and saying a prayer that little bits of happiness will be placed in your pockets exactly when you need it. Your home is lovely Stacey, but I am not the least bit surprised. Thank you for sharing your feelings here this morning. It truly comforts the rest of us. Why as bloggers we don't all do that more often is a mystery. There is beauty in feelings too, right? So sorry for your loss sweet friend. As you know we lost my MIL this past March, and yes, Christmas will be hard this year. You are amazing! It's incredible that you can do all you do and get so much done during a time of sorrow and loss. Your home looks beautiful and festive. I hope it brings you a bit of happiness during a tough time. I'll be praying for your entire family. I am so sorry for you and your family's loss. Most people don't know, I never mentioned it on my blog, but I lost my baby sister this past February. She loved Christmas so much! So I am feeling a little sad myself. Your tree and table look beautiful. Sending hugs. I'm so sad for you and your sweet family, Stacey. This will definitely be a difficult Christmas. I hope that y'all can also find some joy in your beautiful new home and also find peace. I do love your pretty decor. I love the pastels I'm seeing. I love pastels for Christmas! Stacey, your home looks stunning! I love every single detail. I'm so sorry for your loss and I know he will be in your hearts this Christmas. You have two amazing sons! Thank your son for his service and thank the one going to be a nurse for being a caregiver. You've raised two amazing boys! It can be a little hard to get into the typical Christmas ho ho with loss. I know -- my dad died in mid-December and even though it was awhile ago, it still is a reminder each year at Christmas. And that first one was pretty tough in so many ways. So I send loads of hugs. But you are bringing the spirit in with your lovely decorations and yes, the blessings. I love how you have the s'mores ornaments for your boys. They sound pretty terrific. You will be flooded with memories and it will make you sad and happy at the same time. My brother died on Dec 23rd two years ago and it's a hard day for me and my Mom. That day is also my daughters wedding anniversary so it's a sad but blessed day also. Sending hugs. Your home is lovely. Stacey so sorry about your FIL. Even though we know it is coming it still is hard when they do pass. So sorry for this loss. It always makes the holidays a little harder when you lose a loved one. Praying you find peace this holiday season. Your boys sound like great young men. Your younger son becoming a nurse is fabulous. Being a nurse myself I know he is in for the career of a life time. Nursing is such a great profession and I love seeing that men are joining in the nursing profession. Wow and to land a job right out of school at Parkland. That is awesome. My youngest daughter is a pediatric oncology nurse and it makes me so proud to see her compassion and love of nursing too. Your Christmas tour is great. I love seeing all your cozy and serene vignettes. Have a great rest of the week. So sorry for the loss of your father in law, Stacey - it's hard to suffer a loss at any time, but it certainly seems harder to deal with at the holidays, no doubt. You do have many blessings, including your beautiful home and your wonderful family, and your father in law is happy in heaven, looking down on you all. Oh Stacey, I am so very sorry about the loss of your dear Father-in-Law. I know that it's especially difficult during the holidays. I was happy to read about your both of your sons and how they have pursued their passions. Thank you for sharing that with us, and for sharing your beautiful home! Love and God bless you. I'll be praying for you and your family, Stacey. As usual, you managed to make your post lovely and positive. Big hug. I am so sorry for the loss of such a beloved man. This is the hardest Christmas for so so many of us. I love your decorations and that light aqua door takes my breath away. I did not know your father-In-law passed...I am so sorry. There is so much sadness right now, along with so many blessings. How wonderful that your sons are doing so well. Lovely décor as always! Stacey, it's important foe each of us to count our blessings. The loss of a loved one makes our hearts ache, especially when it is recent. Holidays bring to mind so many memories, so when a loved one is missing, the memory becomes a real treasure. I think you have the right attitude, but all the same, this holiday will be bittersweet. Love on your boys. You've much to be proud of there! All the best to both of them. I enjoyed seeing your beautiful home dressed for the holidays. Refreshing, classy, and pretty my dear! Stacey, I think it's O.K. to be sad in the middle of merriment all around you. It's also O.K. to be happy in the middle of sadness. That's the irony of life. Your home is my favorite as are you, sweet friend. By the way, where did you get the nurse ornament? I'd love to get one for my son. The bright spot is "to be absent from the body is to be present with the Lord" How much better can it get to be able to tell Jesus..."Happy Birthday"!! I know your family is hurting and nothing I can say will really help, but there are better times ahead, and your home is your lovely sanctuary. Congrats to your boys....what they are doing is GREAT!! Stacey I'm sorry for your loss. Your decorations are so wonderful. Love your home and the beautiful message today....We thank your son for his service...yes, so many joys and blessings to be thankful for..Have a Merry Weekend Stacey! Your Christmas decor is beautiful, Stacey. I especially love those trees on your dining table. I am so sorry for your recent loss. Words cannot remove your pain or your loss, but please know you are in my thoughts. This Christmas will be hard, but you may find comfort in remembering your FIL's love for you and your family. 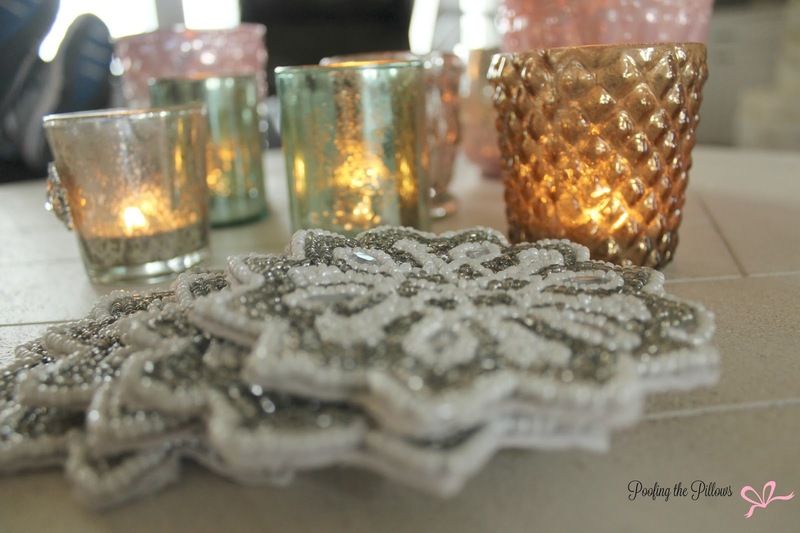 I am moved that you were able to write a post and still be part of the Christmas blog tours. You are putting into action yours and Jemma's goal of the PERK Project. Bless you. That adorable ornament with the green park chair, Christmas wreath, bird's nest, birds, and Joyeux Noël is calling my name. Where did you find it? You're home does look amazing! I'm sorry to hear you are struggling this season but it is understandable with the loss of a loved one so close. My grandmother passed away this April and while it was a bit longer ago and while she was ready to pass I am still finding the holidays just a bit sad this year. She was always so excited about shopping, gifting, and the holidays; humming songs under her breath and planning parties. I think even going through the motions helps a bit and feeling that sadness rather than ignoring it helps me move past it. Every time I see your new home I am in awe of it's beauty. And I love your Christmas decor. Hope you are having a Merry Christmas season. Stacey, I am totally in the same place as you are. Not our best year, but the good certainly outweighs the bad! Your home is so lovely. The trees are your table are simply magical! 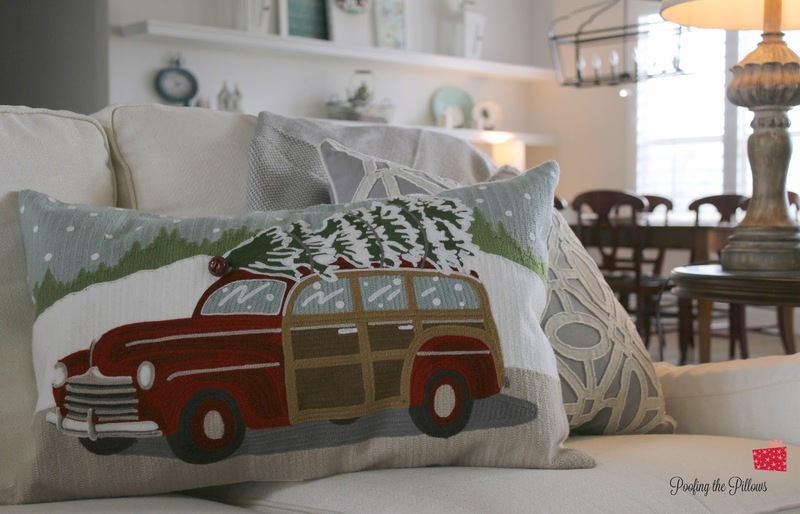 Cozy and inviting, even if you are missing your dear father in law! I am so sorry to hear about your father-in-law. You have my deepest sympathy. Whether it's expected, or unexpected, or expectedly unexpected, it's still a very difficult time. This will be my second Christmas without my husband, and time has not made things easier for me. In fact, I think things get more difficult with the passage of time. So much so, that I have had to change the way that I celebrate Christmas to be able to get through it. For years we hosted a Boxing Day dinner the day after Christmas. I tried to do that last year, in fact I did do it last year, but it was so difficult that I knew it would be my last. My best to you and your family. I'm so sorry for your family's loss. Losing a dear one is never easy, expected or not, but it always seems so much harder during the holidays. I think it just creates so much confusion in our minds & hearts...do we continue to celebrate or do we quietly suffer? I think we all just have to do what feels right, as you have done. Your home is beautiful, & I adore the ornaments for your sons. I missed seeing your kitchen, so I best go do that! Oh, Stacey, I am so truly sorry for your loss, especially during the holidays. May you find comfort in the love of caring family and friends, and may the peaceful spirit of the Lord be with you always. Hugs. Stacey! I love your home and your photos are amazing. 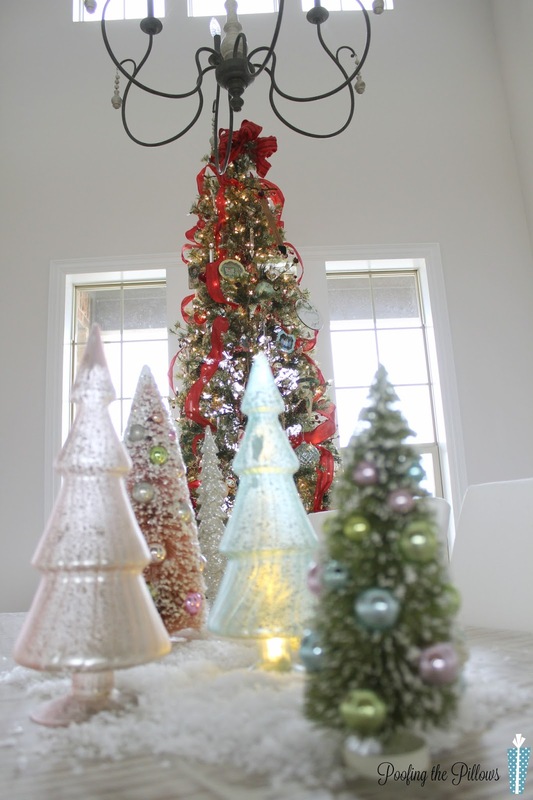 I want to tell you how grateful and excited I was to see your tree on our linky party. It warmed my heart on a particularly trying for me. Stacey, I am very sorry for your loss... My thoughts and prayers are with you and your family in this difficult time. Thank you for the tour of your beautiful home. It looks so festive and pretty. Your sons have huge hearts. They both chose careers to help others. You must be a very proud mama! !